Creator of Tango Silent Films from Portland ! Joe beautifully expresses the connection between Tango and Silent Films, combining the two in a brilliant project. 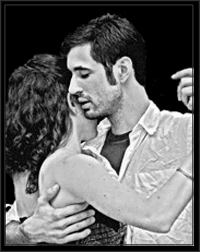 At the Oxygen Beginners’ Milonga, we are so fortunate to have our very own screening of his silent film ”Oh, My, What a Night!” based on the harrowing experience of being a beginner at a milonga. We may think these are times we want to forget, but upon watching this film, we also remember the sweetness that comes with our first memorable dance with a stranger, and the connection that can bloom even from the most awkward of cabeceos.